Note: This is an excerpt from the 19 page photography pricing guide – “Pricing Yourself for Success“. Mathematics and calculations can’t account for two of the greatest variables within the pricing equation; your specific market conditions (supply & demand) and your personal financial goals or situation. To explain differently – math and calculations can be a great approach to come up with what the right price “should be” based upon your costs & revenue goals, however it can’t account for if that number is realistic and achievable relative to your quality of product, target market, supply & demand and more. In fact, if we all worked in an industry with no other competition, we wouldn’t have to worry about pricing pressure either, but alas, that isn’t the case. Not for me in San Diego, and not for you in _____ . Speaking of supply & demand, the graph below demonstrates what naturally occurs to demand, and price, for any good or service as quantity or supply go up. As pricing OR quantity goes up, demand goes down. When reviewing your own pricing, understand the market & region that you are in to get a feel for how this graph would look for your market. Are you in a large city or in a small town? Contrary to common belief, a small town could be awesome for you and your business as there aren’t as many other photographers around. Photographer A is a brand new wedding photographer in New York City who has 2nd shot one wedding so far and is now on their own. Calculations show them they should be charging $4,500 per wedding to reach their goal of grossing $90,000 a year. The results – they only booked 2 weddings for the year from paid advertising in a local wedding magazine. Photographer B is a brand new wedding photographer in New York City who has also only 2nd shot one wedding so far. Photographer B didn’t use any cost based calculations to come up with a price but rather used market research to see what the average wedding photographer price is. Photographer B finds out the average is $2,500 to $3,500 across all photographers with different levels of experience and quality of work. Given this info, they feel they fit in right around $2,000; discounting themselves based on their lesser experience & smaller portfolio. The results – 15 weddings booked from social media, word of mouth & online postings. So who did better, Photographer A or B? The answer is largely dependent upon the individual goals amongst each of them. As you can see – the “right price” is really most dependent upon what your own unique goals are and what is right for you and your business. Lets suppose photographer A works a regular 9-5 job during the week that pays all the bills and their goal is simply to make some extra weekend money here and there whenever a willing client comes up. They can afford to be more picky about the price they set because they aren’t counting on that money and don’t mind if they book 2, 5, 10 or zero weddings. Nor do they have to rely on building a network with other vendors or past brides. On the flip-side, photographer B absolutely wants to become a leading full time wedding photographer. Their goal is much more focused around building their name, portfolio, networking, gaining experience and positioning themselves for higher prices. If so, then they did great and far exceeded photographer A in each of those areas. Photographer B seems like the real winner based on everything above, however, please note, that these numbers are completely fictitious and in no way meant to say that $30,000 a year is sufficient to live off of. Once again, how much money is “enough” is wildly dependent upon your own situation and costs. If photographer B is currently doing wedding photography as a side business, $30,000 a year extra would be wonderful for many people, but of course, if they are solely relying upon that income, it may not be enough. There is no single answer or number that works for everyone. The best answer is simply, the price that gives you the amount of bookings and profits that meets your goals. Whatever you do, I’d caution you to ensure that you are charging a price that does actually give you a reasonable profit and hourly wage. It doesn’t matter how much you love what you do, if you are barely scraping by, I’d encourage you to make some changes to your business and pricing ASAP. Once you come up with a price, you’ll need to pay attention to what the market tells you and make adjustments accordingly. For example, if every single person that contacts you ends up booking with you, you are likely priced too low, and if you are getting inquiries but not booking any of them, you may be priced too high. As you can see, trying to figure out how much to charge for your photography is no easy task, however, I feel that you will be one step ahead if you keep these ideas in mind for your photography business. But before you leave…please note: this article is not to show you how much profit you should be making in order to be successful as that also differs from person to person. 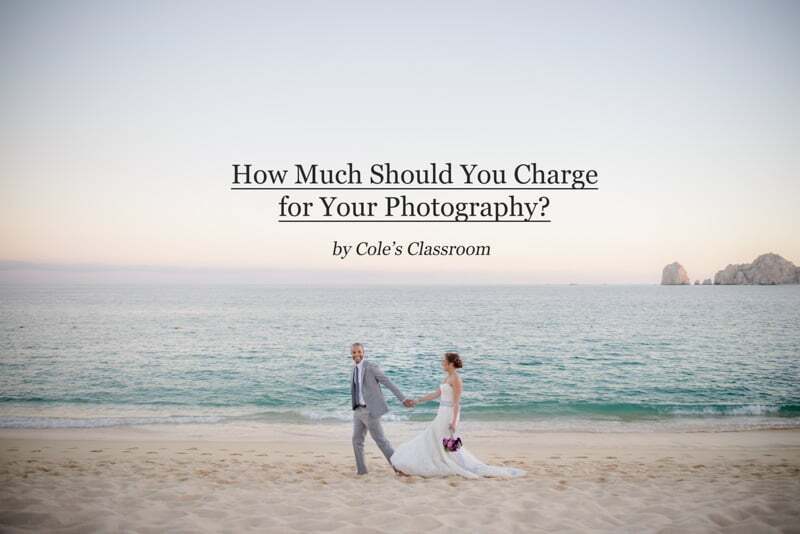 3 Responses to How Much Should You Charge for Your Photography? Check the rates of similar competitors, figure the cost of your work, what you need to make to profit, and set the price. Your name is on your work, so personally, I would keep the quality the best because of that and charge what you need. Try some different marketing, maybe networking…look for alternate ways to find clients. Good luck!